The Eucharist is our true sun, our true life, our true happiness, our paradise already here on earth. Kneel in the presence of Jesus Christ Our Savior. Dear brothers and sisters! Our Lord Jesus Christ said: «I am with you always, even unto the end of the world» (Mt 28:20). Jesus remained with us in the sacraments, particularly in the sacrament of the Eucharist. Jesus sent the Holy Spirit who stays always with us. The Holy Spirit, the third Person of the Most Holy Trinity, dwells in those souls who live in the state of grace. The Holy Spirit lives always in the Church, because the Church is the Mystical Body of Christ. The Holy Spirit is the soul of the Church. The soul gives life to the body and to each of its parts. When the souls departs from the body, the body becomes dead, without life. This applies also to the Church. The Church cannot live without the Holy Spirit. The Church cannot move without the Holy Spirit. All good and holy deeds in the Church are accomplished with the help of the Holy Spirit. Which is the greatest, the most important, the most indispensable act, which the Church could accomplish? This act is the celebration of the Holy Mass. And why? Because the Holy Mass is really and substantially the sacrifice of Christ on the Cross. It is the same and identical sacrifice which Jesus offered upon the Cross for the salvation and the eternal redemption of humankind. On the Cross, Jesus accomplished the most sublime act of the adoration of the Father, of the whole Holy Trinity, offering as the High Priest the sacrifice of His body and of His blood. He did this through the Holy Spirit (cf. Heb 9:14), with the power of the eternal Flame, Who is the Holy Spirit and Who burned always in the soul of Jesus. The sacrifice of the Cross, offered through the power of the Holy Spirit, is really and actually present in all its substance and in all its effects in the celebration of the Holy Mass. Jesus, our High Priest, offers His sacrifice continuously—that means without interruption—through His priests. The human priest is the living instrument of Christ. The human priest was made a true priest by the power of the Holy Spirit. The human priest offers in the celebration of the Mass, also through the power of the Holy Spirit, the immense and divine sacrifice of Christ. The sacrifice of Christ is to such an extent great, that it can not be limited in the tight frame of time and space. The sacrifice of Christ is infinite and eternal. Whenever Holy Mass is celebrated, heaven is being opened, and Jesus Christ, our Eternal High Priest, is present with His immolated body, with His blood poured out, with His merciful Heart where without interruption burns the flame of the act of His total surrender to the Father for the salvation of men. Hence, in the Mass we are gazing spiritually at the living Christ with His wounds, His luminous and radiant wounds like divine diamonds. The mystery of the Holy Mass shows us the truth that Jesus Christ is our High Priest «ever living to make intercession for us» (Heb 7:25). In each Holy Mass heaven is being opened, and with our spiritual eyes we see the immense glory of God, we see with the eyes of our soul the immolated and living Lamb, before Whom all the Angels and Saints in heaven prostrate themselves, falling down on their faces, adoring and glorifying Christ the Lamb with joyful and awed love. 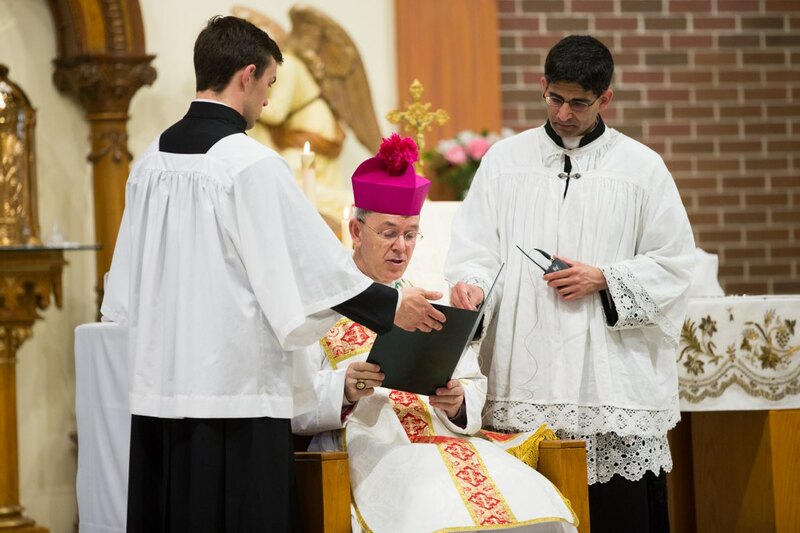 When the priest offers the sacrifice of Mass in the moment of the consecration and elevation of the living and immolated body of Christ, the heavens are truly being opened. What should we do in these sublime moments? We too should fall down on our knees, offering to our Savior the affects of our love, of our contrition, and of our gratitude, pronouncing in the depth of our heart maybe such words as: «Jesus, Son of the Living God, have mercy on me, a poor sinner», or «My Lord and my God, I believe!», or «My God and my All». And then, this Eucharistic Body of Christ, filled with the immense divine glory and with His radiant wounds, is being carried by the consecrated hands of the priest in order to be delivered to our souls as divine food in the moment of Holy Communion. And what we shall do in this moment? Without any doubt, we should greet our Lord in the same manner as did the apostle Saint Thomas, who fell down upon his knees professing: «My Lord and my God!». Saint Peter Julian Eymard said: “Has Jesus not a right to still greater honors in His Sacrament, since He multiplies His sacrifices therein and abases Himself more? To Him the solemn honors, the magnificence, the richness, the beauty of worship! God regulated Mosaic worship in its minutest details, and it was only a symbol. The worship and honors paid to Jesus Christ are the measure of the faith of a people. Let honor therefore be given to Jesus Eucharistic. He is worthy of it; He has a right to it” (The Real Presence. Eucharistic Meditations). The form of the Holy Mass which we celebrate today is the form which had been celebrated even in its details during more than a thousand years. All our ancestors, almost all Saints whom we know from the second millennium—as, for example, Saint Francis, Saint Anthony of Padua, Saint Ignatius of Loyola, Saint John Mary Vianney, Saint Therese of Child Jesus, Saint Padre Pio, the young Saints: Saint Maria Goretti, Saint Francisco and Jacinta of Fatima—all of them were drawing their spiritual strength from this immemorial liturgy of the Eucharistic Sacrifice. This form of the liturgy is therefore very ancient and venerable, it is the form which expresses the constant liturgical tradition of the Church. It should therefore not be called the “extraordinary form” of the Mass, but the “more ancient and constant form” of the Mass. The Church makes it available to us in our days. In this way we can feel as one and the same big family, which embraces Christian generations of more than a millennium. This represents for us a moving fact, which fills us with gratitude and joy. We not only have the same faith, we can as well pray and glorify God in the same liturgical manner, which has been valid and which had been loved by our ancestors. «Jesus Christ is same yesterday, today and forever» (Heb 13:8). Come, O Holy Spirit, and make our faith unshakeable, so that we may not allow ourselves to be confused in our holy convictions by anyone. Come, O Holy Spirit and kindle in our soul the flame of a deep and awed love for the Eucharistic Sacrifice and the Eucharistic Body of our Savior Jesus Christ. Lord Jesus, stay always with us with your Holy Sacrifice and with your Eucharistic Body. The Eucharist is our true sun, our true life, our true happiness, our paradise already here on earth. Amen. 1 Response to The Eucharist is our true sun, our true life, our true happiness, our paradise already here on earth. Kneel in the presence of Jesus Christ Our Savior. Veni Sancte Spiritus! Veni Sancte Spiritus! Veni Sancte Spiritus! When the priest comes to give me Holy Communion, when he says “Corpus Domini nostri Jesu Christi custodiat animam tuam in vitam aeternam. Amen”, I am so grateful that I am kneeling; otherwise I would want to fall down on my knees as Thomas did! A sublime moment to be sure! My Lord and my God! The words come from the depths of my soul , in the Silence of God….. a moment of Deep calling to Deep!!! Abyssus abyssum invocat….there is no need for any more words.